Jackie and Black Label were Reserve Champion in the 3’3” A/O Hunters Week 1 and 5. By week 8, they took home a Reserve Champion in the 3’6” division. 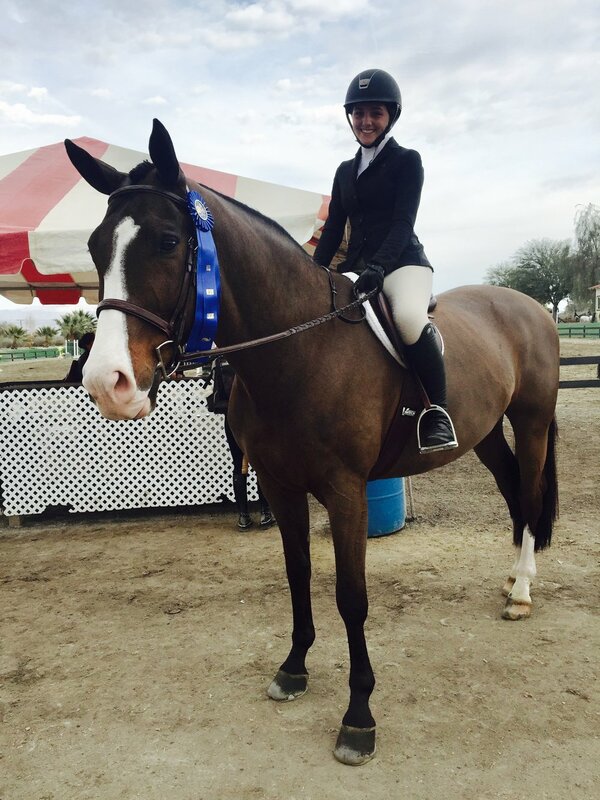 Chloe Cassens and Calypso were Reserve Champion in the Thermal Adult Hunter Division Week 5. Kat Bassett and Ugo de Chalusse were 4th in the Child/Adult Jumper Classic Week 2. 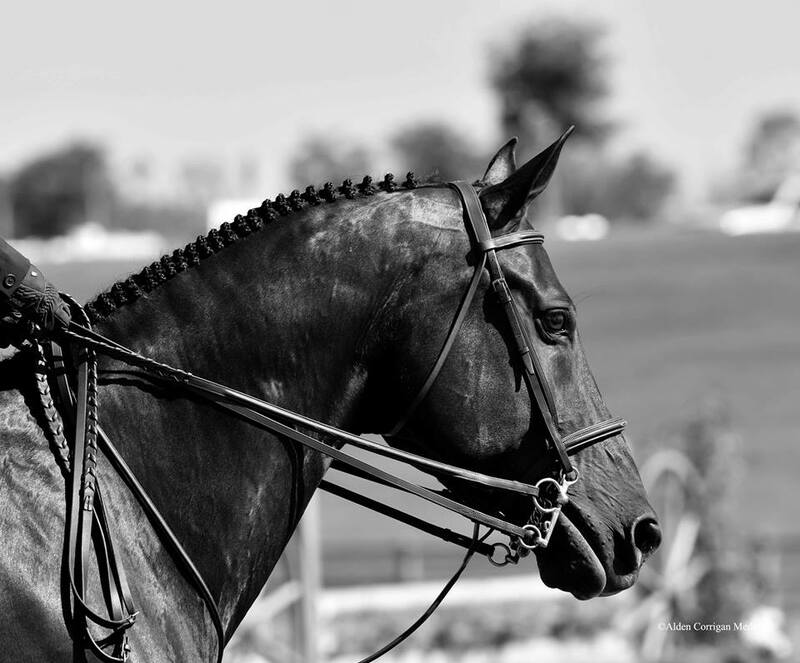 Kat Bassett and Lionheart were 2nd in the SmartPak Adult Hunter Classic Week 3. Molly Graham was Reserve Champion on Tatum Levy’s horse, Brightside, in the Adequan Hunters Week 4. 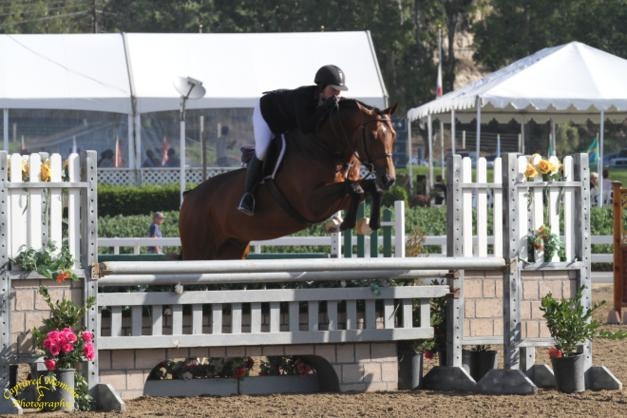 Tatum Levy and Brightside were 2nd in the Children’s Hunters Week 4. Barclay Square and Erin took home back-to-back blues in the 3’6” Green Hunters during Week 4. Karin Binz and Meant to Be were 4th in the Casa Luigi A/O Classic Week 7. Cathy Hayes and her horse Romeo made their debut in Adult Hunters and earned a 2nd, 3rd, and 4th Week 8. Erin and Romeo were Reserve Champion in the 3’3” Performance Hunters Week 8. To Georgia Macy on her lease of Handsel. We look forward to seeing these two excel in the future. 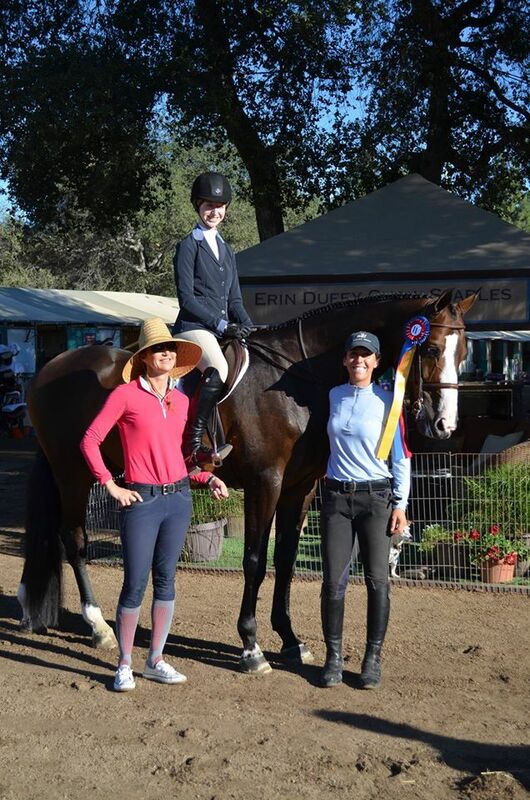 What a great week at The 96th Annual Flintridge Horse Show, Erin won the hunter derby with Black Label 2 weeks in a row!! Josephine and Shadowfax were Reserve Champion in 3'3 a/o hunters and 2nd in the A/O classic, Georgia and Handsel were Reserve Champions in the pre-child/adult hunters, Lisa and Serendipity won the pre child/adult classic, the CPHA horsemanship medal and the SFHJA Medal, Tatum and Air France second in the SFHJA Medal, Lucia and Black Label won the short stirrup under saddle and Erin and Magnolia Lane were champion in the baby greens and reserve champion in the training hunters, good job everyone! Congratulations to Erin and Black Label, winners of the $5000 USHJA National Derby, the pair was also reserve champion in the Low Hunters. Erin was also champion with Faldo in the 3'3 Performance Hunters and Reserve Champion with Magnolia Lane in the Baby Green Hunters. Georgia and Handsel keep doing very well together, claiming the Reserve Champion title in both Pre-child/adult Eq and Pre-child/adult hunters, congratulations to all! The whole Erin Duffy family congratulates Jackie, Erin as well as Brave and Arcadia for a wonderful performance at the indoors shows back east! At Capital Challenge, Jackie competed in the A/O Hunters 3'6 with Arcadia and Brave and had beautiful rounds, the whole barn were able to watch them from home and were cheering for them every step of the way! On their last day, Jackie and Arcadia had an exceptional round in the WCHR A/O 3'6 Hunter Challenge and got an 8th place ribbon against the best riders and hunters in the country. The next show was the Pennsylvania National Horse Show where once again, Jackie rode beautifully and placed in the top ribbons with Arcadia, but the star was young 8 year old Brave who got a 3rd place ribbon in the Handy and stayed in the first place until the last 2 rounds. Congratulations on all your success this year Jackie, we wish you all the success for the next year with your 3 wonderful mounts! It couldn't have gone better last week for Jackie and her 3 A/O horses at the International Jumping Festival at Blenheim. All 3 horses were amazing, Arcadia won a round he first day and also was first in the A/O Classic AND Reserve Champion in the division, Brave followed him closely, getting 2nd place in 2 rounds of the A/O and also placing 2nd in the A/O classic, but the star was young Focus who stole the show with 2 blue ribbons and winning Champion for the first time in the A/O Hunter division. He will be resting until his next show at the Central California Oak Classic while Jackie, Brave and Arcadia go to the East Coast to compete at Capital Challenge and PA National, wishing them best of luck! 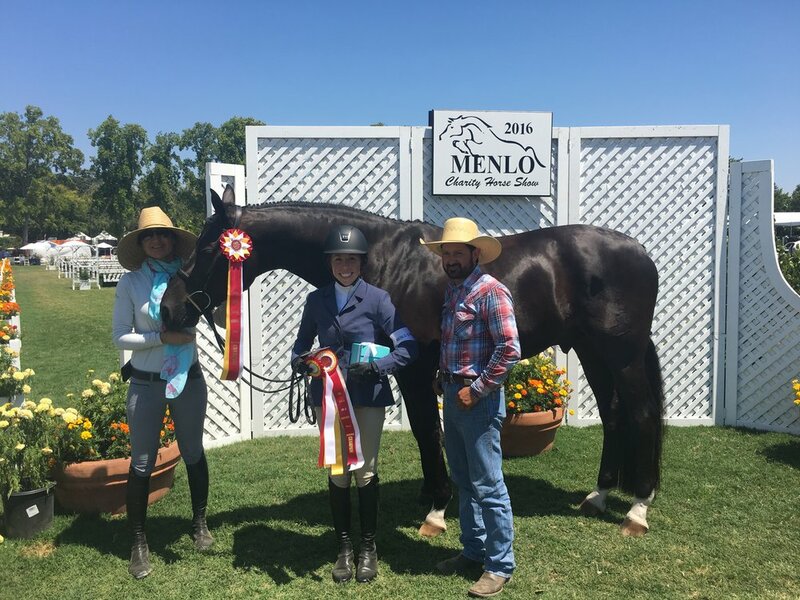 It was time for the hunters to shine at Menlo for the Final show of Zone 10 World Champion Hunter Rider (WCHR). Jackie and Brave were Reserve Champion in the A/O Hunters as well as 2nd in the $5000 China Blue Farm 3'6 A/O Classic. She also was 8th in the $2,500 Kristen Kendall,WFA A/O 3'3 Hunter Classic with Focus and 4th over fences in the 3'3 A/O. It was the first horse show for Jackie and Focus together and they were Reserve Champion in the 3'3 A/O Hunters with a blue ribbon over fences and 2 second place, also finishing 3rd the $1500 Horse & Style Magazine A/O Classic. Jackie was also in the top ribbons with her other 2 horses, getting a blue ribbon over fences in the A/O Hunter and also 2 second place with Brave in the same class. Ella Frey and Macauley are getting closer to qualify to the PCHA Horsemanship Medal by getting 2nd in the class, they also did well in the hunter ring and got a 3rd, 4th and 5th over fences as well as 5th in the Under Saddle in the Children's Hunters 14-17 and were 9th in the $1000 NAL Furth Bonomi Children's Classic. First horse show for Jackie and Focus! Congrats to Jacqueline Attwood-Dupont and Brave who just keep climbing up the ranks, ending up Reserve Champion in the A/O Hunters and 3rd in the $1000 3'6" A/O Hunter Classic! Ella and Macauley stayed in the high ribbons in their classes as well, getting two seconds and one third in the Children's Hunters 14-17 and also third in the Equitation over fences! What a wonderful week everyone had at Paso Robles! Even with the heat, all the riders and horses delivered a great performance and we could not be more proud of them. The Botham sisters were both champions in their respective division, Lucia and Steel Magnolia were champions in the short stirrups hunters and second in the stirrup hunter classic, Georgia and Selfie had their first show together and were champions of the long stirrup hunters ! Ella Frey and Macauley continue their winning streak and were champions of the children's hunters 14-17 and she also was 4th in the THIS medal. Natalie James had some exceptional rounds with her 2 horses, the first day being 3rd on Fleur and 4th on Be Grand in the open 1.10m jumpers and was 2nd with Fleur and 8th with Be Grand in the $1000 Camp Korey at Carnation Farm Adult Jumper Classic. Jacqueline Attwood-Dupont and Brave won 2 of the rounds of the A/O Hunter division and placed in the top ribbons with Arcadia, congrats everyone on a very successful week! Congratulations to Jacqueline Attwood-Dupont, winning a round of the A/O Hunters with Arcadia and Brave and also winning the $1000 A/O Hunter Classic with Brave! And the stars of the weekend are… Ella Frey and Macauley! They were reserve champion in the children's hunters 14-17, won the Betsy Woods LAHSA Horsemanship Medal, as well as placing in the top 4 in all her medals. Thanks to Natalie James for having such a great horse for Ella to ride, they love each other! The grass was looking green and pretty for the first horse show of the year at the Oaks, and the horses loved getting a free snack after every class ! It was WCHR week at the Spring Classic and Jacqueline Attwood-Dupont and Brave won the handy round in the A/O Hunters the first week and the following week she was second with Arcadia and 3rd with Brave in the same class. Ella Frey and Macauley were champion in the Limit Equitation and also won a round in the Children's Hunters . Natalie James and Fleur were 4th in the Adult Jumpers and 4th as well in the Adult Amateur Jumper Classic on sunday, getting the fastest time in the jump-off with 1 unfortunate rail. Natalie did also very well with Be Grand, getting 4th in the Low Adult Jumpers and clear in their first time moving up to the 1.10m Adult Jumper Class. Good job everyone! Off to the next show! What a great show Thermal has been for Erin Duffy Show Stables this year! We would like to congratulate the riders and horses who did so well throughout the whole circuit and ended up being Champions in their division 1st half, 2nd half and grand circuit champions! Week after week, everyone rode at their best, Natalie James and Be Grand got a couple blue ribbons in the 0.90m and placed second twice in the Adult Jumper Low. Natalie was also very consistent with her other mount, Fleur, delivering spectacular rounds every week in the 1.15m Adult Jumper Classics and placed 6th on the last day. Ella Frey was back in the ring for the first time in 2 years with Macauley and they were Champion in the Desert Child Hunter 2'9 week 7 and Reserve Champion in the Modified Child Hunter week 6. Lucia and Salt Water Taffy were Champions week 6 and 8 in the short stirrup Eq Pony and Champion week 7 short stirrup Hunter pony, Georgia and Great Expectations were Champions week 6 in the short stirrup Eq Horse and Champion week 7 and 8 short stirrup Hunter. Georgia did also very well with her pony, Steel Magnolia, ending up Champion week 6 Short Stirrup Hunter Pony and Champion week 7 in the Eq. Good job everyone you make us proud! Congratulations to all the riders at Erin Duffy Show Stables for being so successful during the first half of the circuit at HITS Thermal. Jackie Attwood-Dupont were Champions in the A/O Hunters every single week they competed and were half circuit Champions! Lucia and Salt Water Taffy won an over fences in the short stirrup equitation, were second in the flat and they were Champions of that division! Georgia and Steel Magnolia brought home the blue in a short stirrup equitation over fences and half circuit circuit champion! Natalie James and Fleur were 8th in the 1.15m Adult Jumper Classic the second week and many double clear rounds as well, good job everyone! And it's a wrap for the 2015 show season! What a great way to end with the team getting great results at HITS Thermal National Sunshine Series. Natalie James was on fire with both her horses, getting clear round after clear round and collected the blue ribbon in the Low Adult Jumpers with Fleur and then with Be Grand the following day. She also was second in the 1.10m open jumpers in the Grand Prix ring and kept going with high placing getting 3rd and 4th with her in the Adult Jumpers. Brave and Jackie were shining in the Hunter ring in Amateur Owner Division, getting mostly 2nd and 3rd ribbons and 2nd in the A/O Classic 2 weeks in a row! These 2 were also the winners the Foxfield Medal Equitation. Ayanna Frey and Diantre also did great in the Equitation, placing 2nd and 5th in the 14-15 and also making it to the work-off of the CPHA JR medal and the USEF Pessoa Hunter Seat. Lindsay Ransom and Pavie were second 2 times in the 3'3 performance hunters and Xander and Karin Binz were shining in the Adult Hunters, getting 1st and 2nd as well as 2 second place in the Adult Equitation. Also a special congrats to Erin and Macauley, Reserve Champion the first week and doing extremely well in the low hunters the second week for his first show back with the barn. Congrats everyone, can't wait to keep going on the winning streak in 2016! 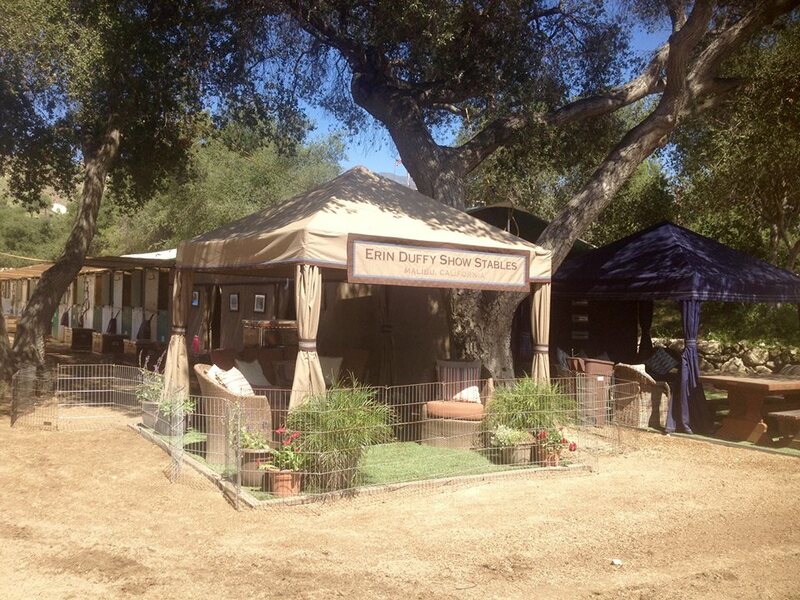 Congratulations to all riders and horses at Erin Duffy Show Stables for a great week at Flintridge Autumn Classic! Samantha and Don Ramiro were champion in the equitation 18-35 and reserve champion in the adult/amateur hunters as well as 5th in the classic. Natalie James and Fleur were 2nd in the low adult jumpers and 4th in the adult jumpers and great with 1 rail in the a/a classic on sunday, she was also 5th with her horse Be Grand and Professor Lexus was a little star in the 0.80m jumpers for his first horse show back. Ayanna Frey and Diantre won two rounds of the Junior Hunters and were Reserve Champion in that division as well as 3rd in the junior hunter classic. Jackie Attwood and Brave won one of the hunter round of the A/O Hunters and were 2nd in two of the over fences and were Reserve Champion and 3rd in the A/O classic. Lucia Botham and Salt Water Taffy were 4th in the short stirrup equitation flat and 8th in the stirrup classic and it was their first time showing in the short stirrup! Georgia Botham won the eq flat and one of the o/f and one of the hunter rounds and was champion in the long stirrup equitation and reserve champion in the long stirrup hunters! Congratulations to the Erin Duffy Show Stables team for 2 great weeks at Showpark Summer Classic and Showpark All Seasons Tournament! Pavie and Lindsay Ransom won the first round of the 3'3 performance hunters with great results in the division. Jacqueline Attwood-Dupont and Arcadia were 2nd in the A/O Hunter Classic the first week and won the classic the second week as well as 2 rounds of the A/O Hunters over fences. Natalie James was second in the Low/Child Jumpers and fifth in the Adult Jumpers with Fleur and had great rounds with her new horse Be Grand in the Low/Child Jumpers. Jane Bacharach was clear and 5th in her Jumper class, and Jackie Attwood-Dupont and Brave won the WCE with a score of 88!! Good job everyone! Congratulations to all horses and riders for 2 successful weeks at Showpark Racing Festival and Showpark August Festival in Del Mar. Jackie and Arcadia were Champion in the Low A/O Hunters winning 4 of the 5 classes in their division. Jackie was also Reserve Champion with Brave, this was the first show for Brave out of the jumper ring and into the Hunter and Equitation divisions and they were also Champion in the Modified Jr/AO Hunters and won the CPHA Medal. Ayanna Frey and Diantre had a fabulous show as well, Reserve Champion in the Low Junior Hunters, won a round in the Open Modified Hunters, 2nd in the Maclay ASPCA Medal and 4th in the CPHA Medal. Raleigh Bacharach and Pavie were Champion in the Low Hunters, she also placed 2nd in the Child/Adult Jumpers with Wyliecoyote. Natalie James and Fleur were double clear in the low Child/Adult Jumpers and 8th in the Classic and also double clean with her new horse Be Grand. Jane Bacharach and Cavalletta 2 were double clean and fast in the 1.00m Jumpers and got the 3rd place ribbon. Last but not least, Georgia Botham and Salt Water Taffy were Reserve Champion in the Long Stirrup Equitation division and 1st and 2nd place in their Hunter rounds. Good job everyone! Erin Duffy Show Stables is proud to announce the purchase of a Horse Gym 2000 Treadmill. For those wondering about the use and purpose of this wonderful machine, here is a short description from their website of what you can expect from the use of it (Lexus here demonstrating). "The variable speed and incline of the treadmill allows the workout to mimic over-ground conditioning. Walking the horse on an incline is a great way of improving stamina and building muscle strength, particularly in the back and hind quarters.The combination of adjustable speed and incline, as well as the ability to control the intensity and duration of a session, provides ample variety in a horse’s conditioning program allowing it to be tailored to the horse’s specific needs.The treadmill belt provides a smooth, consistent surface, eliminating injuries from uneven footing. Equine treadmills have proven to be particularly useful for rehabilitation work. " Congratulations to Jacqueline-Attwood Dupont and Arcadia, champions in the 3'3 A/O hunters 2 weeks in a row at Paso Robles! Natalie James at the barn with her new jumper Be Grand. Congratulations Natalie! A warm welcome to 5 year old baby Focus, Jacqueline Attwood-Dupont's new mount! Erin Duffy Show Stables team just had 2 successful weeks at The Flintridge Spring Classic and 94th Annual Flintridge Horse Show! Ayanna Frey and Diantre 1st in the 3'3 junior hunters, 3rd in the Junior Hunter Classic and 4th LAHJA Jr medal and 6th in the CPHA Foundation, Jacqueline Attwood-Dupont and Arcadia champions 2 weeks in a row in the A/A hunters and 1st place with Brave in the modified Jr/Am class, Natalie James and Fleur champions in the 0.90m last week and double clear in the low child/adults jumper classic, Jane Bacharach and Cavalletta 2 double clear in the 0.90 jumpers. And also for their first horse show Georgia Botham and Steel Magnolia Champion in her 3 divisions (opportunity equitation, pleasure and cross rails) and Lucia Botham and Salt Water Taffy Reserve Champion in both her divisions (opportunity equitation and pleasure)! Good job to all riders and horses!